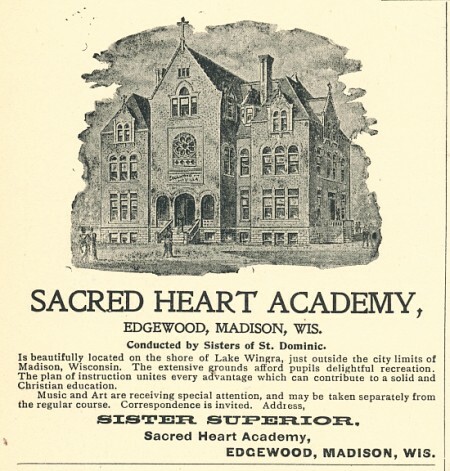 This article on Sacred Heart Academy (the predecessor of Edgewood High School–there was not a college there yet) appeared in the Saint Clara Academy, Sinsinawa magazine The Young Eagle, in 1900. Sacred Heart Academy, Madison Wis.
DEAR EAGLE: AS each month draws near its close, we Edgewood girls look eagerly toward the southwestern corner of our state, watching for the coming of the ever welcome “EAGLE” which brings sweet tidings of the “Mound girls” and the dear Sisters who are helping them make life worth living. The kindly editors gave us, early in the year, an invitation to contribute an article to the columns of their famous school journal. We are relatives, you know; “Edgewood girls” have always been and always will be cousins, if not sisters, to all girls under the care of Sinsinawa Dominicans. The school year is drifting away so rapidly, we feel that it is time to tell our southern friends what we have been doing, how far we have advanced on the pathways they themselves have been treading; how high we have climbed on the much talked of “Hill of Science,” which they themselves are mounting with so much energy that we feel like laggards in comparison. 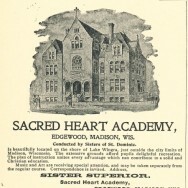 The Sacred Heart Academy, familiarly called “Edgewood Villa,” opened in September last, with an attendance of forty-three pupils; before Christmas this number increased to fifty-four, and now sixty happy, youthful beings may be seen, and, needless to state, heard within the “Villa’s” homelike walls. This seems a small number to you who count something near two hundred as constituting a school, but remember, we belong to a branch, not to the trunk, of the “Dominican Tree,” and to us sixty sounds great, for it is the first time the Villa has had so many student inmates. Our grades are similar to those at St. Clara, and we follow the same course of study, but not with equally great advantages in the way of apparatus and similar equipments. Our cabinet of instruments and our museum of scientific specimens are small and their application limited, compared with the costly and comprehensive equipment at St. Clara. Still, we have geological, zoological, as well as botanical specimens that are rare, curious, and valuable, and our apparatus, as far as it ranges, is excellent. The library is small, as may be expected, but comprises a collection of volumes that are choice, and, thanks to the Reverend donor of many of them, valuable. We have no graduates this year, and only three young ladies are preparing to take the teachers’ examination for this county. Those who arc successful at this examination are entitled to the laurels which, conferred on an Edgewood pupil in June, admits her, in the following September, to the graduating class. The Second Academics of this year constitute a class of excellent promise, and if they return next September, will, without exception, earn their laurels and reflect credit upon the school. The First Academics are also bright and promising; in fact, though the Academic department comprises as merry-hearted and fun-loving a band of girls as ever graced an Academy, or made things lively for a corps of teachers, yet they are all earnest, hardworking students. The studio is “a place (thing) of beauty and a joy forever.” The lovely work of the artist’s brush meets the eye, in rich profusion, on every side; glowing pictures, exquisitely adorned chinaware, beautifully engraved cabinetware, Showing the charming results that fire produces when acting in Pyrography instead of destruction, and delicately beautiful pictures of the fancy materialized in water colors. The fancy work class is large and its members are daily employed for a happy hour in producing results that are prophecies of homes beautified and made dainty and attractive by the skillful fingers of the home-makers. The German. French and Latin languages have devoted students pursuing their charming though difficult mastery. The music class comprises almost the entire school and represents almost double the number, because many of the pupils take lessons on two instruments, besides taking voice culture, and each pupil has extra hours of practice. The three divisions of the school, according to age, that is, Seniors, Juniors and Minims, are banded together in three reading circles: The “Corona Sapientia,” the “Veritas,” and the “Holy Angel” circles respectively. These prepare their literary work on Saturdays, and devote an hour on Sunday afternoons to its presentation before the members of the circle, and as many of the teachers as may have leisure to be present. “Open Meetings,” which are attended by all the inmates of the Academy, are given once a month. Dramatic and musical programmes are produced occasionally throughout the year. The preparation for these entertainments’ with their presentation on some notable occasion, or memorable feast day, is considered an important part of a pupil’s mental education and physical discipline. Among our more intellectual pleasures we rank visits to the auditorium of the State University, where anything of special interest, literary and musical, takes place. The Edgewood pupils have appeared on the miniature stage in their study hall once a month on an average during the past year. The first experience was a musical and dramatic entertainment given by the “Corona Circle” in October in honor of the Rosary festival. Another evening in October was made pleasant by an “Open Meeting” of the “Holy Angel Circle.” The wee lovers of books gave all the numbers, and the vocal and instrumental music also. What is known as “Founder’s Day,” November 4th, was celebrated by the “Veritas Circle,” which presented a mixed programme of serious and touching productions in honor of “Father Samuel,” and lighter ones to enliven the occasion. The music was rendered by the Junior members of the class. One evening in November little Miss Florence Gilbert gave, as private elocution pupil, a recital. The music, vocal and instrumental, that delighted the audience between her readings, was rendered by the Minim members of the music class. The little lady issued her own invitations several days previous to her recital, and distributed her programs on the occasion. These show that she gave seven elocution numbers, as her part of the entertainment. On November 16th, a “Cecilian Memorial” was given by the members of the “Cecilian Music Circle.” The program, which was most brilliantly and successfully presented, was as follows: A Tribute to St. Cecilia, a biographical sketch; “The Striking of a Few Comical Chords,” “A Conversation in Two Strains,” by one division of the Music department; “The Slumber Song,” with movements by the Minims, with Miss Lamping as accompanist; a piano solo, “Tanoweise,” Meyer-Helmund, by Ruth Douglass; a discussion, “Classical Music versus Popular Music,” by another diyision of the Music department; a vocal selection, “The Angel’s Serenade,” Braga, by the vocal class, accompanied on violin by Jennie Lamping, on mandolins by Mary Kean, Leila Gilbert and Regina Maloney, on the guitar by Florence Maloney, on the piano by Alta Beardslcy; concert recitation, “The Organist’s Fatal Pride,” by members of the Elocution Class; piano solo, “Chanson Hongrose,” Dupont, Mary Kean; recitation, “Haunted Organ,” by KittieKunz; piano solo, “Hirpc Aeolicnnee,” Kruter, Zella Meeker; recitation, “Mystery of the Golden Slipper,” Florence Maloney; “Hymn of St. Cecilia,” the Cecilian Circle, accompanied on piano by Florence Maloney. The programs tor this entertainment were very prettily printed by a friend of the institution, and a considerable number of its friends from the city were present on the occasion. In December, Miss Florence Maloney, as private elocution pupil, gave a recital, members of the music class kindly assisting. Besides the pieces which Miss Maloney presented, “Milton’s Ode to the Nativity” was read by the teacher, the tableau being represented by the posing of the Misses Vance, Maloney and Kean. “A Poetical Tribute to the Angelus of our Blessed Lady” was also read, while the members of the Elocution class, twenty-two in number, represented, by their posing, four tableaux at a time, for each stanza. The Christmas celebration consisted of a “Cantata,” especially adapted to the season, and beautifully produced by members of the Music department. A number of very pretty and suitable minor parts were presented by the Minims, Christmas being their special feast. In February occurs the Feast Day of our dear Mother Superior. With the forethought that humility gave birth to, she requested the teachers not to prepare a celebration for that feast, mentioning, with great zeal, the special date which was not to be commemorated. We girls, not feeling bound by other people’s vows of obedience, anticipated the date by two or three days. We had far more sport preparing for this program on the sly, we are quite sure, than the audience had in assisting at its presentation. Grecian robes had to be made, white cords had to be manufactured, and many other important preparations made all with the utmost secrecy, lest we should find the blessed vow extended to us in some wonderful manner. Much to our gratification you, St. Clara girls, were being musically cultured at the time by a delightful “Clark Recital,” and certain Mission Sisters were invited to enjoy this musical treat. Thus was insured the absence for a few days of her whom we wished to honor, as we love her. Such a flying about with yards of white cheese cloth, such twisting of white darning cotton into heavy cords, such practicing on Grecian knots, such tying on of Grecian bands, as took place during those few days, have rarely been seen, and was never more fully enjoyed. The eventful evening arrived and the surprise was complete. After the customary address and presentation of gifts, came two short comedies, two single recitations by elocution pupils, piano solos, vocal numbers and to account for the Grecian robes, Fr. Ryan’s “Song of the Mystic” read by one and pictured by the varied posings of twenty Academics. This was followed by a drill, an original affair too long to be described. The evening of Washington’s birthday was made exceedingly solemn and august by an historical and biographical program produced by the united efforts of the three reading circles. The Father of his Country appeared in the course of the evening, in every guise, from that of boyhood with the “inevitable “hatchet,” to that of manhood with the sword. The opening chorus was a hymn to St. Patrick, accompanied on the piano by Ruth Douglass; this was followed by a poetic tribute from the Third Academics, and a prose tribute from Alta Beardsley. A motion song, “The Children’s Frolic,” was charmingly given by the Minims. A conversation, regarding the genius and character of the Irish people, was conducted by several of the Academics. A poetic selection at the close was delivered by N. Vance, M. McHugh, L. Barry and M. Kean. “Oft in the Stilly Night” was sung with marked expression by members ot the vocal class. A poetic comedy, “The Brushwood Babes,” gave the Minims opportunity to do their best, and they did not fail. Piano solo, “Comin’ Thro’ the Rye,” was played by Mary Kean and a poetic drama, “Madame Learning,” was well given by the Juniors, whose costumes were rich and elaborate. “Pictures of Erin,” a pantomime, followed; the reader was Ruth Douglass; accompaniment on piano was played by Xella Meeker; the pantomimists were twenty Academics; piano solo, “Gypsy’s Dance,” by Lucille Samorida; recitation, ”Grandmother’s Story of Ireland,” with little Florence Gilbert as grandmother, and wee Winifred Howard as child. “Greetings to Ireland,” concert recitation by the Seniors, with a “Prose Introduction” by Alice Bunker. “The Shamrock Garlands” consisted of tableaux and a drill; the reader was Z. Meeker, the music was by R. Maloney, the posing and the drill by the Academics. The drill consisted of figures made and sentiments expressed by the movements of hoops made of tin, (36 inches in circumference) and twined with shamrocks; there were seven pictures represented and fifty-six emotions expressed. The closing hymn to our Blessed Lady was accompanied on the piano by Miss Maloney. 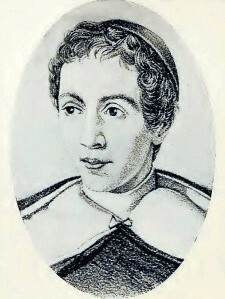 A considerable audience gathered from the city, and among the friendly faces was to be seen, that of the Reverend friend, whose birthday occured on March 17th, whom we intended to especially honor and congratulate. In May, the Juniors will entertain us, and in June we will all entertain the public. Among our good times, we must not forget to number away up high on our list a sleighride to Oregon where our Rev. Chaplain’s brother is pastor. Mother Superior gave us the ride, and the kind pastor of Oregon entertained us most hospitably, and in a fashion most acceptable to school-girls; at all events, few had an appetite for supper on their return. Besides this happy event, we have enjoyed candy-pulls, character parties and other jolly times familiar to all boarding-school girls. Early in October the Academic department founded a Shakespeare Class, electing a corps of officers, adopting a special motto and choosing colors. At first, the class met on Wednesday evening for an hour, but found it more convenient to meet for half an hour on Mondays and Wednesdays at 10:30 a. m.
On Sundays and holidays, we have congregational singing during the services in the chapel. The twenty-three non-Catholic pupils join voluntarily in the singing of the hymns. Dear “EAGLE,” I fear that we have made up for my delay in appearing by staying too long and occupying too much of your valuable space.